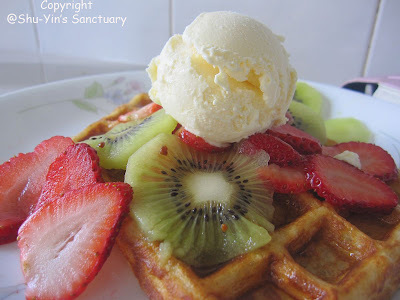 I saw this 'Waffles of Insane Greatness' being titled in one of the post in Julie's blog, and was intrigued by the title, so I looked at the recipe. This recipe is simple, with no beating of egg whites or things like that. And also it calls for corn flour to be added into the batter, which I find interesting. 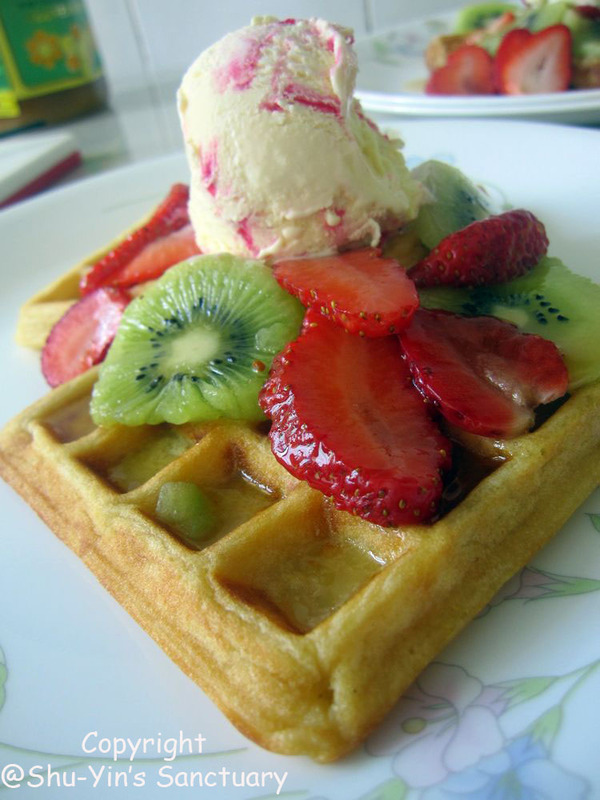 And I recently bought a Kenwood waffle maker and this was a chance to use it. 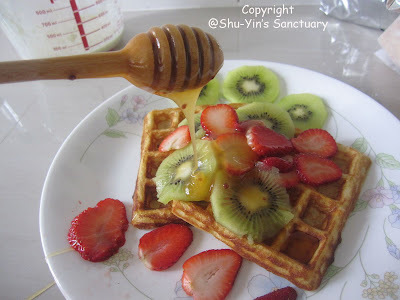 I followed the recipe to make the waffle batter the poured it into the maker. It yields 5 crispy and fluffy waffles. Crispy on the outside and fluffy on the inside. 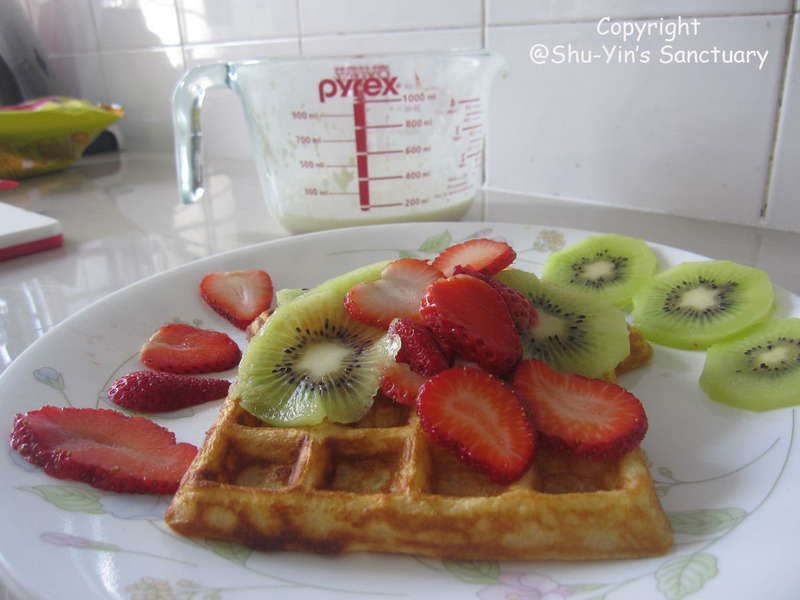 I cut some fresh strawberries and kiwi fruits to add to my plate of waffles. Drizzled some honey on it. And lastly topped it with a scoop of vanilla ice-cream. And this was my breakfast. One thing though. My Kenwood waffle maker takes so slow to make 2 waffles. Almost 15 minutes waiting time. If I am to make waffles for my whole family of 7 people including Shern, it would take me 1 hour and 45 minutes assuming that each person takes 2 pieces. In a bowl, whisk together the flour, cornstarch, sugar, baking powder, baking soda, and salt. Add the milk, oil, egg and vanilla and mix well. Let the batter sit for 30 minutes. Yaiks!!! 15 mins for each batch of waffles??? That's so long. I've seen other waffle makers taking much lesser time. I'm not going to get a Kenwood waffle maker after this for sure. i dont think I'm exaggerating. Minimum also it took 10 minutes and that was when i put less batter in it, hoping to get a faster waffle for my hungry stomach. if i knew, i wouldnt buy it too. but i got mine cheap. rm100 or so, so i guess cheap things are like this sometimes. sigh..
yalor. stupid kenwood waffle. 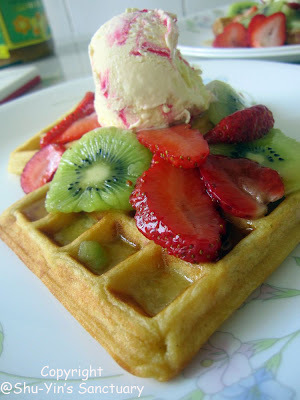 another good waffle maker with good reviews is Cuisineart brand..but that one arr...thousands of ringgit wan. siao man! 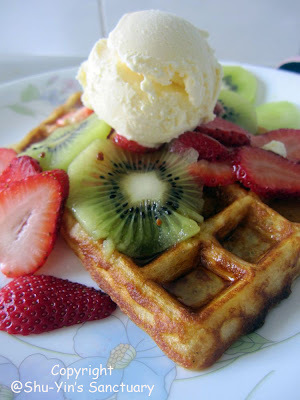 although the kenwood waffle maker so lousy..took so long, but the waffles churned out are good and tasty. so ok also la!